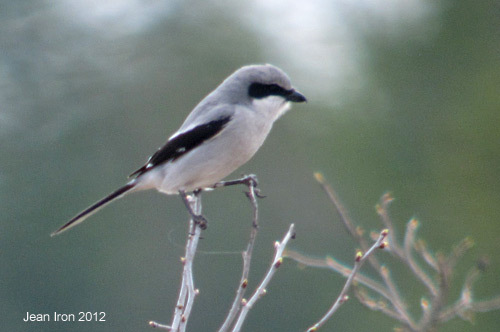 Ron Pittaway and I saw this banded Loggerhead Shrike on the Carden Alvar on 25 March 2012. The band combination on the left leg is blue over orange, and on right leg is white over metal. We think this is the same bird that was seen and photographed at Windermere Basin in Hamilton on 18 March 2012 as reported by Cheryl Edgecombe on Ontbirds. My photos were digiscoped from a public roadside. 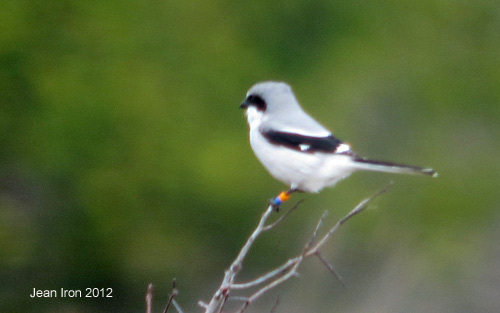 We also saw this Loggerhead Shrike with an orange band over blue on the left leg and white over metal on the right. 25 March 2012. 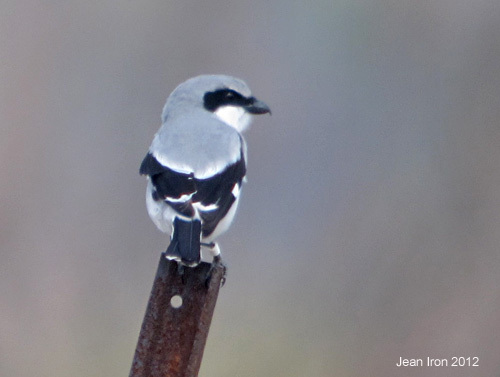 Carden Alvar Loggerhead Shrike wintering in Virginia. Note by Jean Iron and Ron Pittaway in February 2012 OFO News.